Brimfield Antique Show—Head to Brimfield, MA, for the largest outdoor antique show in the country. With thousands of dealers selling everything from fine antiques to kitschy collectibles, there is plenty to see and buy. Just be prepared to walk: The grounds are vast, and you will need more than one day to visit all of the fields. Maine Open Lighthouse Day—Lighthouses throughout Maine are open to the public for one day: September 8. It's a rare opportunity to step inside these heroic beacons including some that aren't routinely open to visitors. Mt. Washington Valley Mud Bowl—For more than 35 years, North Conway, NH, has been hosting the Championship of Mud Football, called the Mud Bowl. Teams throughout New England compete in this three-day touch football tournament played in a field filled with mud. All proceeds benefit local charities. Oyster Festival—If you are a fan of this saltwater bivalve or looking for a fun fall activity for the whole family, head to Norwalk, CT, for the annual Oyster Festival. In addition to plenty of deliciousness on the half shell, carnival rides, arts and crafts, harbor cruises and headline entertainment are highlights. 29th Annual Hampton Beach Seafood Festival—With chef demonstrations, a lobster roll eating contest, live music, a fireworks display, and seafood from 60 of the Seacoast's top restaurants, there's no better time to visit Hampton Beach, NH. The Big E—New England's largest fair in Springfield, MA, runs for 17 days, and this is your first weekend opportunity to indulge in all of the Big E's famously enormous food. Of course, there are amusement rides and farm animals to see, plus parades, concerts, shows and quirky traditions like the chance to watch butter sculptors at work. Boston Local Food Festival—Touting "healthy local food for all," this festival on the Greenway in Boston, MA, is free and features food from local farmers, restaurants, food trucks, and fishing boats. There are also chef demonstrations, music performances, and activities for kids. Newport International Boat Show—Whether you are in the market for a new boat or just want to visit picturesque Newport, RI, this boat show is the perfect excuse to enjoy the city's stunning waterfront. Telluride by the Sea—The Telluride, Colorado, Film Festival heads east for Telluride by the Sea in Portsmouth, NH. View six new movies—fresh from their debut—at the Music Hall in this seaside New England city. 20th Annual Harvestfest and "Chowdah" Cook-off—Set in the scenic mountain town of Bethel, ME, this festival celebrates fall with a chowder cook-off, apple pie contest, music, arts and crafts, and a farmers' market. New Hampshire Highland Games—This Lincoln, NH, weekend event showcases Scottish culture and features exciting competitions—including heavy athletics like the caber toss—plus plenty of Scottish goods and food. What the Fluff? Festival—Did you know that Fluff was invented in Somerville, MA? This madcap festival celebrates the marshmallow spread with live bands, silly games, and crazy contests—as well as imaginative Fluff treats to try. 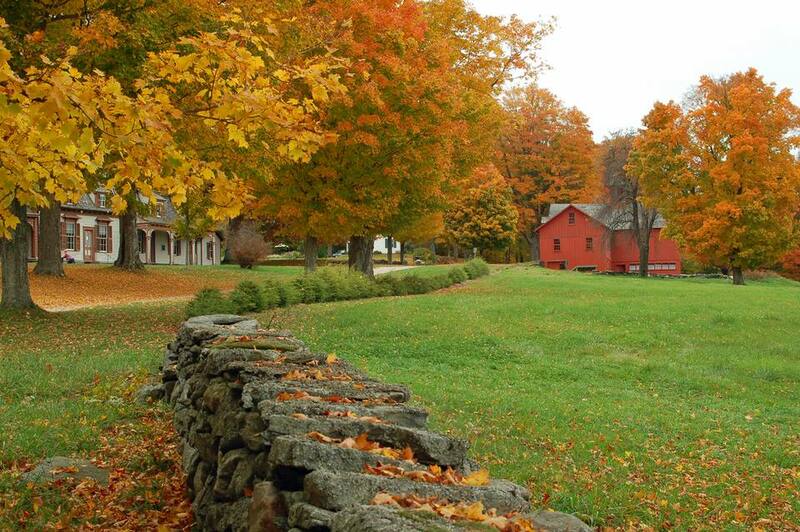 Old Deerfield Fall Craft Fair—On the grounds surrounding Old Deerfield's Memorial Hall Museum in Deerfield, MA, is a fall arts and crafts festival that is sure to delight and impress. Shop for furniture, jewelry, apparel, pottery, and much more while enjoying live music and specialty foods. Vermont Wine and Harvest Festival—Enjoy a weekend of wine tastings in and around bucolic West Dover, VT, featuring local vineyards, as well as artisans and gourmet food producers. The highlight of the weekend is the Grand Tasting at Mount Snow Resort: a day of wine, shopping and scenic chairlift rides. Vermont Pumpkin Chuckin' Festival—Ever wonder what happens to a pumpkin that is hurled through the air by a trebuchet? At this annual festival in Stowe, VT, teams compete to project pumpkins the farthest. A chili cook-off rounds out the wild event. Great New England BBQFest at Wachusett Mountain—Bring your appetite to this two-day event in Princeton, MA, featuring not only BBQ but lively music, craft vendors, cooking demos, a farmers' market, and leaf peeping SkyRides. Fall Foliage Parade—With a different theme each year, this annual parade in North Adams, MA, delights spectators. Topsfield Fair—This agricultural fair in Topsfield, MA, celebrates its 200th anniversary in 2018. Over the course of 11 days, you can see racing pics, Canadian Mounties, monster trucks, New England's biggest pumpkins, and country stars like Martina McBride. Harpoon Octoberfest—This South Boston Octoberfest won't disappoint, with plenty of fresh Harpoon beer, oompah music, and German food. Haunted Graveyard at Lake Compounce—Intended for adults and older children, this amusement park turned Halloween attraction in Bristol, CT, is scary. Starting this weekend, it opens at dusk Friday through Sunday through October. Jack-O-Lantern Spectacular—Walk paths through the Roger Williams Park Zoo in Providence, RI, and see hundreds of jack-o-lanterns carved into mesmerizing works of art. This nightly event runs through November 4. Damariscotta Pumpkinfest and Regatta—You've never experienced pumpkin mania like this! In Damariscotta, ME, enormous pumpkins are paraded each Columbus Day weekend, and they're also dropped on cars and transformed into boats and works of art. Their smaller kin are catapulted, raced, and turned into desserts. It's a pumpkin-flavored feast for the senses. Cranberry Harvest Celebration—Wade into a cranberry bog at this old-fashioned, family-fun festival in Wareham, MA, which features a juried craft show, chef demos, and helicopter rides for aerial views of the crimson-colored landscape. Return of the Pumpkin People—Vote for your favorite pumpkin people display on a self-guided tour in and around Jackson, NH. This creative and amusing event runs the whole month of October. 71st Annual Warner Fall Foliage Festival—Celebrate fall scenery in Warner, NH, with concerts, parades, a 5-mile road race, a lobster and chicken BBQ, and carnival-like fun. Apple Harvest Festival—Enjoy a weekend of apple goodies, alcoholic beverages, entertainment on three stages, rides, and amusements at this popular community event in Glastonbury, CT.
Bowen's Wharf 28th Annual Seafood Festival—If you love seafood, this historic wharf in Newport, RI, is the place to be. Live bands—from blues to surf rock—add to the laid-back vibe. 34th Annual Harvestfest and Kidsfest—Horse-drawn wagon rides, music, an old-fashioned market, plus plenty of local food equal a memorable fall day by the sea in York Beach, ME. 28th Annual Pumpkin Festival—Bring your jack-o-lantern to Laconia, NH, for this two-day spectacle, which culminates with the lighting of the 34-foot tower of grinning pumpkins. The line-up of events includes a zombie walk, a car show, and a duck derby, plus there are rides, concerts, and games like pumpkin bowling to amuse all ages. Harvest on the Harbor—This annual food and drink festival in Portland, ME, offers diverse delicacies for every taste. Head of the Charles Regatta—Watch rowers compete in this historic regatta that takes place on the Charles River between Boston and Cambridge, MA. Vermont International Film Festival—Get your flicks fix at Burlington, VT's 11-day film festival featuring screenings of dozens of feature-length films and shorts. Ghosts on the Banke at Strawbery Banke—Kids can trick-or-treat at historic homes in Portsmouth, NH's oldest neighborhood. Spooktacular Chili Challenge—Ready your appetite for some fiery chili at this Simsbury, CT, cook-off. Live music and a costume contest add to the ambiance. 38th Annual Essex Fall Craft and Fine Art Show—Start your holiday gift shopping early at this enduring show in Essex Junction, VT. Admission also includes entry to the Vermont Antique Expo and Sale.